I spent a full twenty minutes staring mournfully at the meat display in my local supermarket this evening. I left, took in a brief tour of the truly disturbing fish aisle, resisted the cake section and then went back to staring at the meat. I pondered some sausages, then figured that the best way to deal with the whole shebang was to make a swift detour to where the arborio rice was, pay and run like blue bloody murder. I have nothing against the supermarket, it's bright, shiny, clean and new and they actually have a good range of terrifyingly regular organic veg, that I feel smug about not buying. Mine's delivered by the fine folk at Farmaround, if you were interested, and they guarantee their veg is always misshapen, in the best traditions of comedy veg across the world. Oh yeah, it comes in a sack too. Very important that your veg arrives in a sack, I find. The supermarket is generally fine to be honest, I have no major beef with them, yeah, it would be nice to have more variety of fruit and less of breakfast cereal, but, hey, supply and demand, what you gonna do. I just couldn't see anything in that meat counter that made me think, I want a slice of animal today. Even the organic meat sat staring at me from behind plastic packaging and looked sanitised, safe and million miles too far from the beast it had come from. I'm not saying I haven't bought Jamie Oliver branded steaks like the best of them, but I was just depressed a little by it all today. Once safely home it was the hot stove for me. There is nothing more of a pain in the arse in the kitchen than making risotto. I wish that there was an easier way, but there isn't. You just have to stir and keep stirring. That's it. Get you stirring hat on and get on with it. 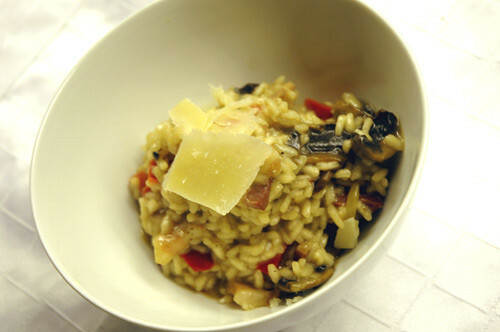 And don't believe what anyone says about risotto being hard to make properly. Wankers. Just stir over a hot stove for quite a while and you'll have it. You'll hear a hundred slightly bizarre stories about how it's made at Harry's Bar in Venice or how someone's Italian grandmother cooks it by facing St. Peters and stirring four times one way and four the other. Really, you just need a hardy elbow. Here, pancetta and mushroom risotto, took about 20 minutes and was topped off with shaved parmesan. Big, deep flavours that linger and satisfy and make you feel like your home. P.S I'm somehow quite amused that I used my potato peeler to shave the parmesan. Don't know why, it just tickled me. But not in a weird way. yeh, being tickled by a potato peeler would be weird. looks yummy... comforting and satisfying Im sure.